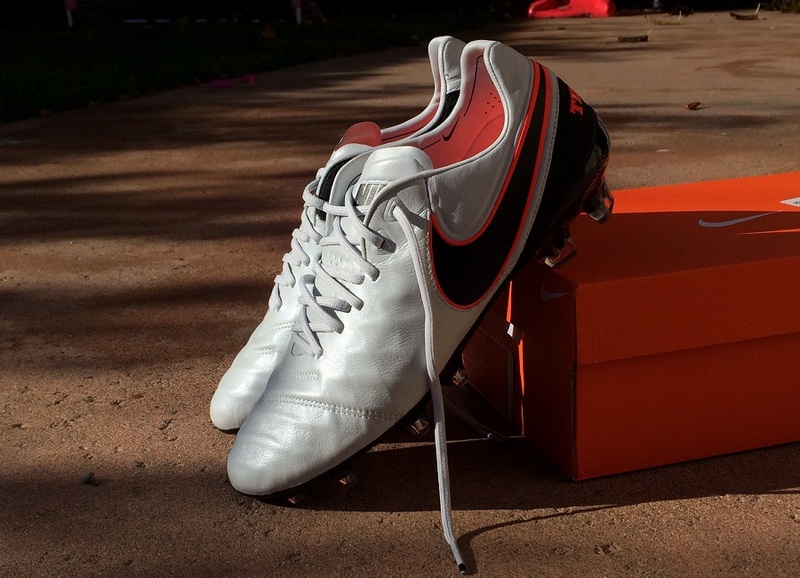 The release of the Nike Tiempo Legend 6 produced little in terms of surprise when they dropped in November. In a world where dynamic mid-cut collars seem to rule Nike’s line-up, having a classic silhouette that evokes heritage appeal is absolutely invaluable. There are, however, several key updates and features on this boot that are intended to take performance up a notch. There is obviously something unique going on with that defined yet extremely sleek upper. But what exactly does it have on offer and how does that play out compared to prior releases? The release colorway in the series comes in this Pure Platinum/Black/Total Orange colorway with a retail price of $209.99. Find this version available at soccer.com. Since this a boot that falls into the comfort/heritage category, you won’t be too surprised to hear they are a glorious boot to wear. 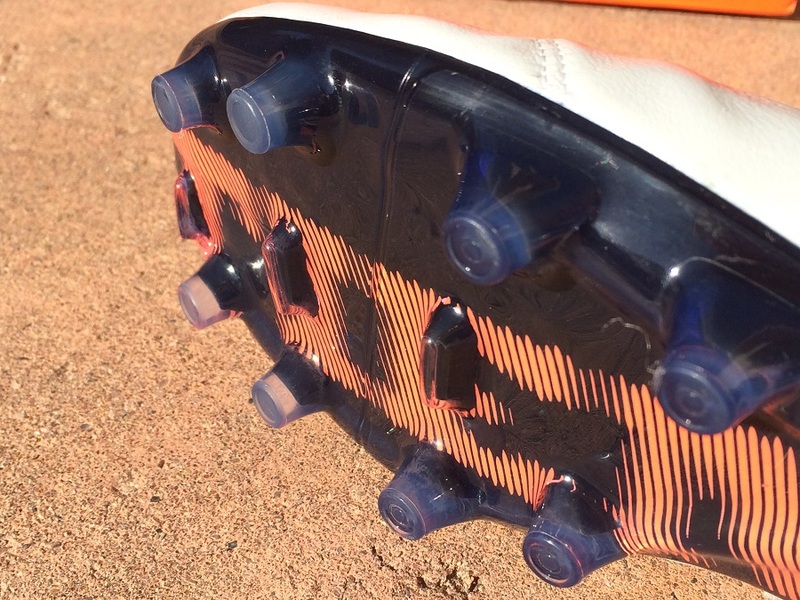 Right out of the box, the upper and soleplate are flexible enough to break into a game first time. The upper consists of a leather with an internal cage system underneath. This cage provides support to maintain shape while allowing for a lighter overall construction. You can feel its presence if you run your fingers across the buttery soft leather upper, the cage itself being plenty flexible. 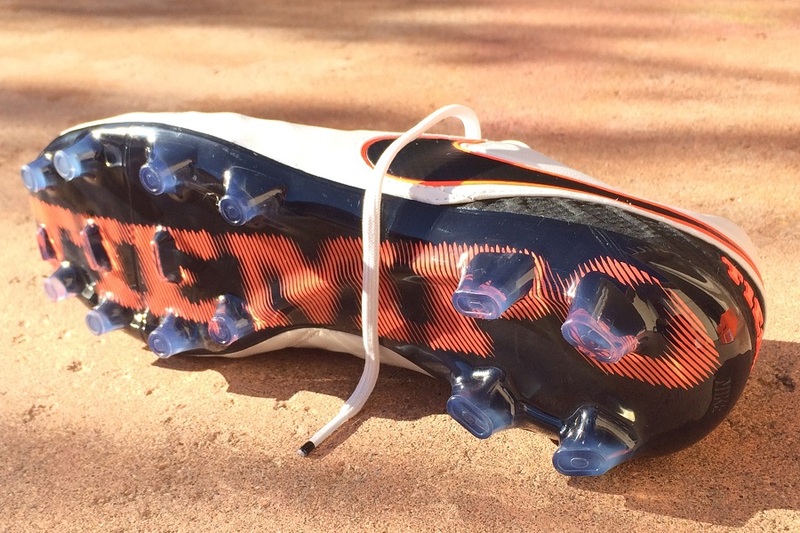 One area that highlights the effort Nike has placed in this boot is the tongue. A thin layer of memory foam, almost like a sponge, lines up against the top of your foot and grips you down in place. Coupled with the fact the tongue is built into the boot, it provides a unique but much appreciated fit that is emphasized as you tighten the laces. Nike also include a decently strong internal heel counter that comes into play through wear. First, it cups your ankle and locks it down in place during play. Second, it acts as a protective barrier from stray boots and studs that come into contact with the area. All in all, I don’t see many players finding complaints in the overall comfort of these, and they are primed and ready to break into game right out of the box! 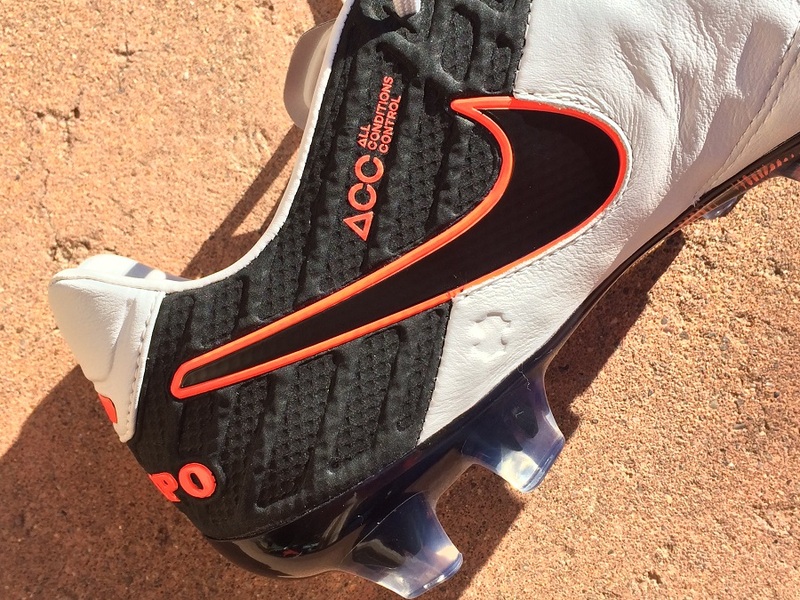 In a wise move, Nike use a leather upper across the upper of the boot to provide optimal touch on the ball. This time around, things are left very clean, with only two cross layers of stitching placed along the fold lines of the forefoot. Visually, it looks sharp and from a performance perspective, it improves what the boots have on offer. Underneath, a structural support cage is put in place and this adds a defining feature to the boot. You get a lot more definition thanks to a lattice style construction along the instep and a V like appearance direction down towards the toes. It is subtle enough that you don’t feel it on your foot, yet it definitely provides some extra texture as you get touches on the ball. To date, I’ve had no complaints about the upper and have been left thoroughly impressed with how it has worked out in many different playing situations. They feel great to shoot with thanks to the added definition; passing is complimented by that clean, crisp upper; and the little extra padding through key areas (like the tongue and instep) dampens first touch and control. 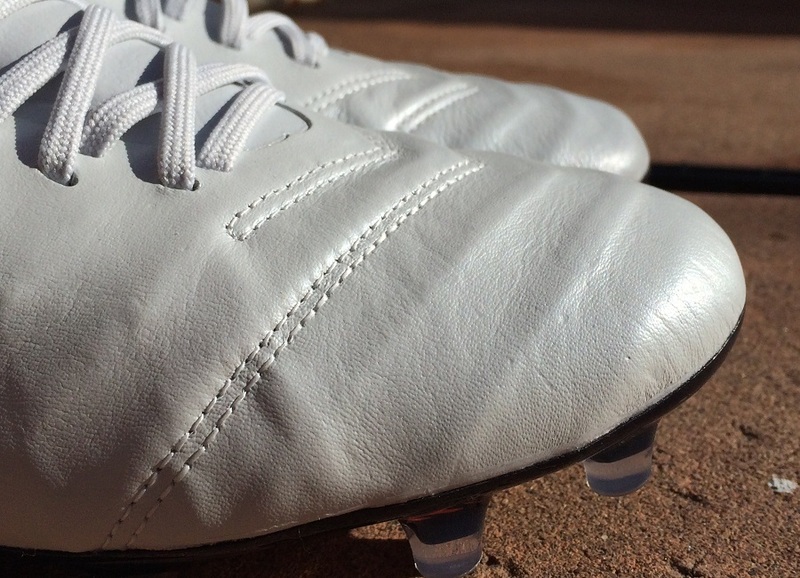 As you wear the boots over time, the leather continues to improve as it breaks down and molds to your foot shape. If you are concerned about overstretch, I’ve found that the internal cage system provides the needed support to reduce deformity. In other words, they keep their shape nicely while actually getting more supple with age! The general construction and pattern of the Tiempo Legend remains unchanged from the previous model. It is an area that proved successful and really wasn’t in need of modification. As a result, you get the same impressively natural dual-density TPU soleplate right out of the box. What I really like is how flexible they up around the toe region, providing an excellent level of natural bend as you chop and turn quickly. Nike has worked to create a form fitting style that moves in unison with your foot movement from first wear. The conical stud configuration makes them an ideal candidate for players that play on both FG and AG surfaces. Thanks to their positioning and shape, the studs provide one of the better options across multi-surfaces. You get plenty of solid traction without losing out on drag through lateral movements. This is key for midfield players who are consistently moving across the pitch. Visually, a new swoosh design is added to create a fresh effect for those left chasing your shadows! Nike has gone with a one-piece tongue on this boot, but they also have an added twist. In order to create an ease of entry, the tongue is joined from the third eyelet down. So, yes it is a one-piece but you also have an open area across the top that makes the boot easier to slip on while also creating a unique visual effect. If you loosen the laces it is very easy to see how it is positioned under the laces. It is a simple touch that decreasing problems for players who have a wider fit. Simply loosen the laces and open the tongue forward to create a wider space to slip your feet in! The real positive on the tongue is the sponge like feel that leaves them feeling completely in tune across the top of your foot. Comfort is added, and you also get the benefit of a little extra padding should you get stuck in hefty challenges or want a boot that distrubutes shot pressure a little more evenly. This is a very much true-to-size fitting boot that has an accommodating width through the forefoot. It doesn’t quite fit into the wider fitting boot category, but Nike they will suit a wider variety of players. It is important to note here that Nike has made changes to the sizing from the 5th to this 6th edition. If you found the 5 was tight (like I did) these will provide a much improved fit. I normally wear a size 9US, that is what I wore through testing, and I wouldn’t change up or down for any reason. I’ve got to admit, both the 5th and 6th versions are completely awesome in their own unique ways. When the 5 was released, I drooled just a little. 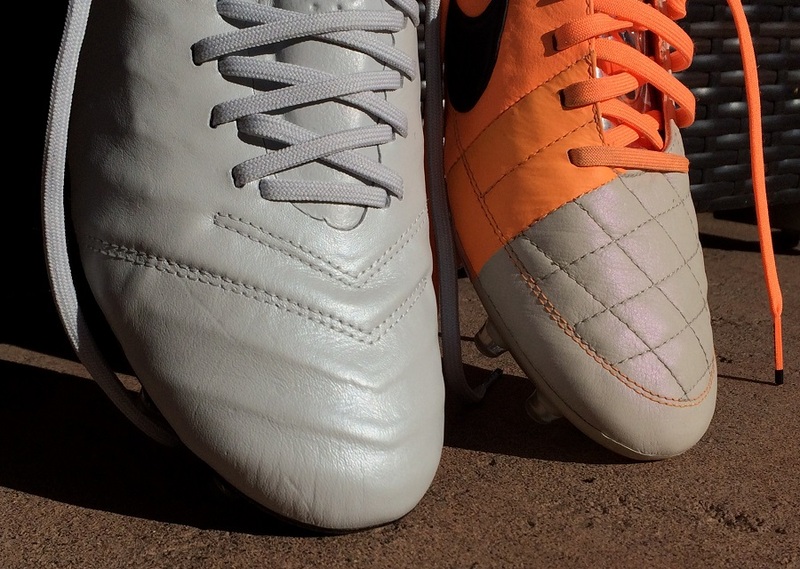 They have a killer visual design and really set a new tone for the Tiempo Legend series. Then in walked the 6 and my mind was blown a little more. There are obvious differences between both including the construction and materials used in the upper. But each provides quality, reliable performance. If there was one significant difference that needs to be pointed out it is the fit through the forefoot. The 5 received some negative feedback for their constrictive upper structure. They were just a little too tight and a half size up produced a slightly better fit. Nike has addressed this with the 6 and the end result is a much more comfortable and form fitting boot from first wear. Adidas left a huge void when they decided to take the 11Pro completely off the market. If anything, it plays right into the hands of Nike as players look for a replacement style heritage boot. A key feature that both boots have in common is the underlay cage system. 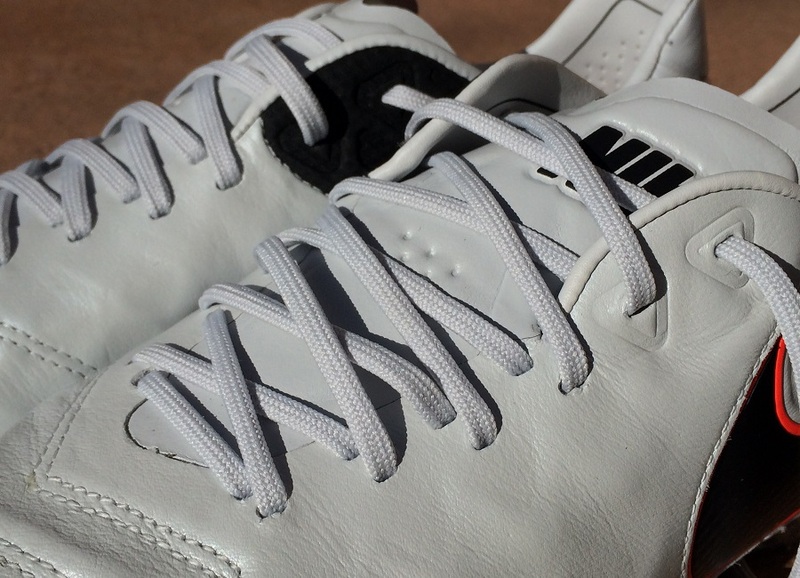 On the 11Pro it provided additional support to a very thin K-Leather material. Over time, the leather definitely loosened up, but kept its shape intact thanks to the lattice style cage. The role of the cage on the Tiempo series is a little more defined. 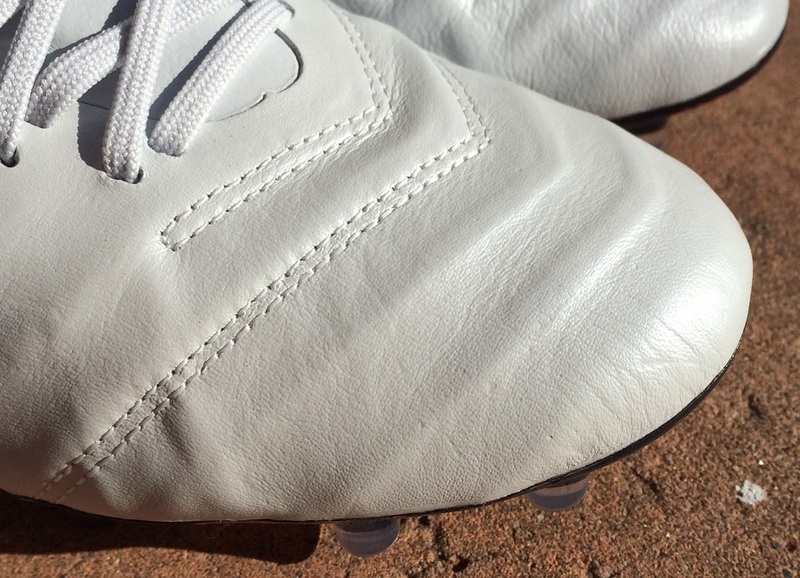 Rather than just keeping the boots shape, it also provides a lot more definition through the upper. This in turn allows for a little extra texture and improved touch on the ball. Who are these intended for? When it comes to touch on the ball, these are a real winner. That, in turn, plays right into the hands of the players they are intended for. Think players that like to get on the ball, keep it simple with crisp clear passes, dedicate their game to improving others around them. This could actually apply to a lot of players on the pitch, from goalkeeper to hard hitting midfielder or goalscoring striker. Basically what I am saying here is that these boots are very, very open ended. They match player style rather than a particular position. I’ve actually found myself recommending them to many different players on the pitch over the past few months. Several of those that purchased have followed-up with gleaming reports and a huge thank you! I’ve got to give Nike my thank you shout-out here, for making my life easy with an easy recommendation! I’m stumped on this one trying to find something to be critical about. Instead, it is a case of Nike getting it right! This is a simple release that evokes the correct feelings you expect to get when holding a pair of Tiempo Legend boots. Can Nike make a better version in the future? Probably. But for now, I’m set on enjoying what these have on offer! Find all current Tiempo Legend VI colorways available at soccer.com. Highlight: A boot that meets our expectations with excellent comfort and quality heritage style performance. Leather upper is highlighted by an underlay support cage system. Would I Buy Them: Oh yes – these are one of the top performing boots on the market right now. In terms of the current Nike line-up, they are a very refreshing addition! Player Position: Rather than position, this one is all about playing style and those that like to get on the ball, keep it simple with crisp clear passes, dedicate their game to improving others around them. How do this compare to the support cage in Adidas 11pro? Are Obras more comfortable than these Tiempos? Hey Bryan, loving your work! Tiempo VI or Morelia Neos? What do you prefer? Tough call! 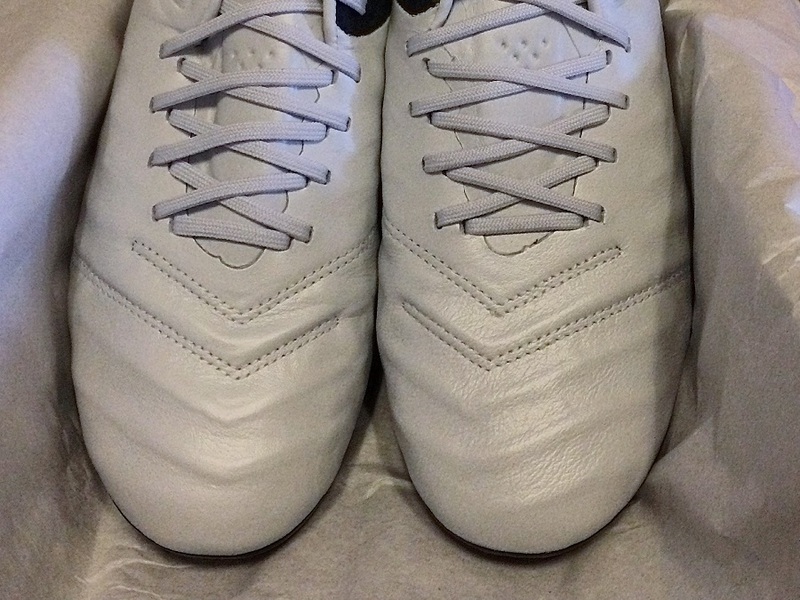 I love the lightweight feel of the Morelia Neo plus the shape around the ankle. 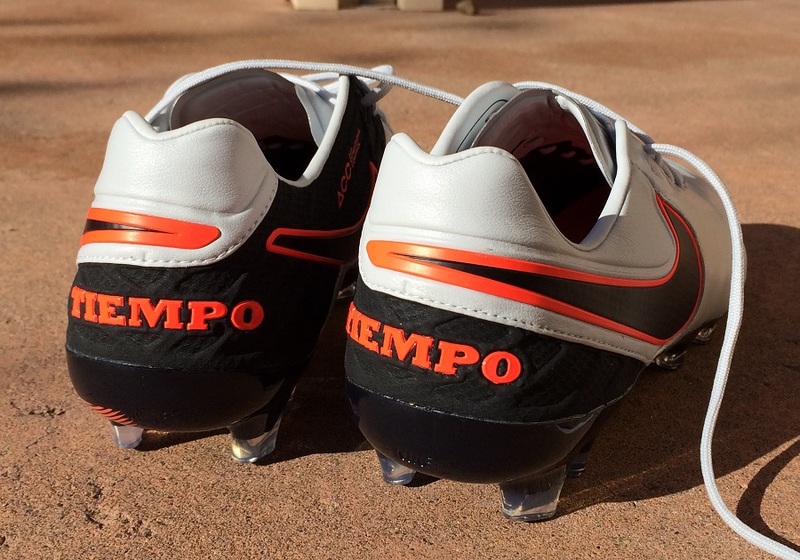 The Tiempo VI is very clean and has great fit through the forefoot. I'm going to stay independent and state I like a bit of both really! Just buy Morelia Neos MIJ, can't be wrong. How is the durability on these as compared to the mizuno morelia neo? Also when will the review for the new evopower be up? 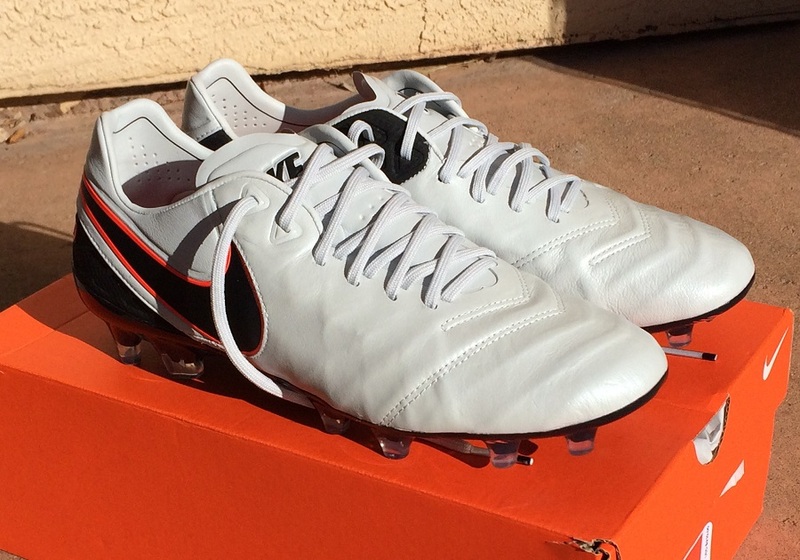 These offer better durability than the Morelia Neo. evoPOWER 1.3 is on the list – review completed, just need to find the time to write it up! Can you give me an update on durability? To date, my pair are still in very good shape, the forefoot is super soft as they've broken in through multiple wears. I haven't heard any comments from readers encountering durability issues, so that is usually a good indicator that durability is good! Nike’s own website is filled with comments from customers complaining about poor durability, especially premature sole separation. While this is not a random sample- people with issues are more likely to take time to comment- it’s still not a good sign. Yeah I am really worried about those reviews on Nike’s site at the moment. 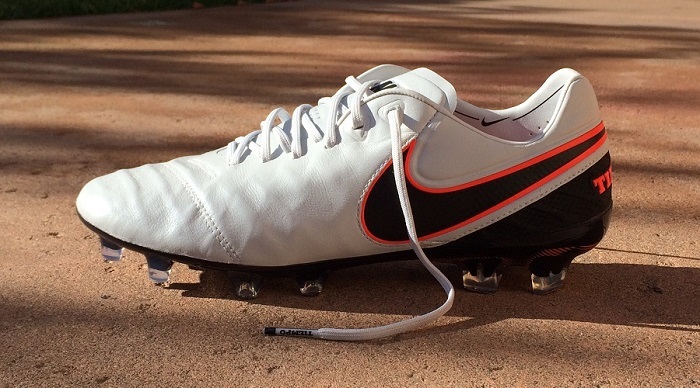 I am in need of new boots soon and Tiempo Legend VI is definitely on my radar. But if durability is an issue I might be more tempted to try something else. Visited soccer store on the weekend. Guy admitted 1 in 3 pairs are being returned with durability issues. The upper separated from the sole after three practice sessions. My son is very disappointed after paying $230. Hoping the seller will refund because we will not risk this again. He plays on the school varsity team and practices on grass. One issue I have had is that they are a bit tough to get on despite having a perfect size thanks to the tongueless design. As a result I have found the leather tear ever so slightly where the tongue is joined to the boot probably where my foot stretches it while putting them on. The tear has almost reached the first lace hole and I am worried it will break it. Have you noticed this at all, Bryan? It does make it a little tougher, but I haven't notice and tears (thankfully! ), Alex. You definitely need to loosen the laces and give it a little stretch to get your foot in. Nike is pretty good with replacements if it ever tears off. My teenage son loves these boots more than any others he’s ever had. Sadly, they experienced the sole separation that seems to be endemic to this model. Not acceptable on a boot that lists for $210. How does the sizing compare to mercurials. If I'm a size 8 in mercurials should i stick with size or go up or down a size for the tiempo 6? Very disappointed with the green ones i bought two months ago. I must have used them twice and then started to notice the leather peeling away from the plastic sole at the bottom, right on the side of the cleat, where it borders the bottom plate. Spending over $200 for a cleat, you'd figure this shouldn't happen. Especially two uses in. Excuse any errors. Typing on my phone.